In a town made famous by its beer, the most famous place to belly up and have one is probably Wolski’s, a family owned establishment since 1908. The bar itself can be hard to find, tucked inside an old cream city brick house along wandering Pulaski Street, a few blocks southeast of a westward bend in the Milwaukee River. But bumper stickers proudly proclaiming “I Closed Wolski’s” are not nearly so obscure. They have been plastered all over town for more than a generation. Lately though, Pulaski Street is becoming known for a new kind of slogan. “No Overlay District, Alderman D’Amato” signs have adorned most of the houses near the bar for several months now. A place to drink, throw darts, and shoot pool has become the epicenter of a political movement. Maps are being drawn, petitions are being signed, and strategies for overthrowing the powers-that-be are being discussed. There are parallels to the American Revolution, an uprising discussed and organized in the taverns north of Boston 230 years ago. The minutemen drank and slept there, then fired muskets at the redcoats. In this case, however, the perceived enemy is not an invading royal army. It is people who live nearby, and have for decades, some of whom even used to drink at the bar. “I used to watch Packer games at Wolski’s,” laments Ginger Duiven, a neighborhood resident since 1988. “It makes me sad that I can’t do that anymore.” Duiven is on the board of the East Village Association (EVA), a neighborhood group started in the mid-90s. So is Bernie Bondar, who owns Wolski’s (the original last name has been lost through marriage) along with his two brothers, Mike and Dennis. Bernie and Ginger, however, have very different ideas about the future, and the past, of the EVA. Shouting Matches The full EVA Board of Directors has not met since June, an unprecedented gap in the group’s schedule. This was brought about by shouting matches that occurred every time the board tried to meet this spring. Those shouting matches were mostly over a disputed election last November. That election was so contentious because of new zoning guidelines proposed (and by now implemented) in the neighborhood, called the Conservation Overlay District. Those guidelines are less restrictive than the more common Historic Preservation District rules, but more restrictive than the city’s standard zoning. In fact, this is the first time this style of zoning has ever been implemented in the city of Milwaukee. “That’s what is terrible about this,” said Joe Kaye, an EVA member who owns property in the neighborhood. “Whoever controls the EVA controls the zoning in the neighborhood.” Kaye’s comment typifies the current mood at Wolski’s, where the old guard of the EVA is perceived to have shoved the Conservation District’s new zoning guidelines down the throats of an unwitting neighborhood. On its surface, however, the comment is clearly false. The EVA, no matter who is on the board, does not control the zoning in the neighborhood. The EVA can make proposals and it can take advisory votes. But the Common Council gets the final decision on all zoning changes, and they approved this unprecedented Overlay District for the East Village last December. If there is truth in Kaye’s comment, it is a much more sinister truth, and it is at the center of a far-reaching conspiracy stretching from neighborhood living rooms, across empty lots and planned condo developments, all the way to the chambers of city hall. Kaye, a lawyer, does not allege this conspiracy merely over beers at the bar. He is now alleging it in federal court, where just last month he filed a Racketeer Influenced and Corrupt Organizations (RICO) claim against the local alderman, Mike D’Amato and other city officials, against various local developers of whom he is a rival, and against the very association of which he is a member. The lawsuit also names at least two EVA members: Shirley Ferguson and Lisa Christopherson. It was in Ferguson’s living room, two blocks from Wolski’s, where this conspiracy allegedly began. “Back in 2001,” explained Bernie Bondar at a neighborhood meeting last month convened by himself and fellow EVA board member Brian Delfosse, “Alderman D’Amato had a secret meeting in Shirley Ferguson’s house, and that’s how this whole Overlay District got started.” Neither D’Amato nor Ferguson disputes the facts of that claim, except for the use of the word “secret.” D’Amato, in particular, is not shy about presenting his version of events. The alderman described a years-long process, which resulted in the Overlay District. “This procedure,” he said, speaking from his city hall office, “was initiated by a neighborhood group [the EVA], it was assisted by city hall, it received a number of public hearings, no less than three, where public input was taken, and no less than two mailings were sent to every property owner in advance of the final vote. It passed the Common Council unanimously.” Indeed, as far back as the summer of 2003, a full year and a half before the Common Council vote was taken, the following entry, under the heading, “Conservation District — What is it?” appeared in the EVA newsletter: “After a year of working to put together these guidelines for the East Village Conservation District a special meeting is being planned to present the guidelines. With all the new interest in the EVA it is important to guide developments that might detract from the village-like atmosphere we now all enjoy. Supporter Alderman Michael D’Amato will be mailing out copies of the guidelines and an invitation to attend a special meeting to all homeowners in the proposed Conservation District.” In the next EVA newsletter, the following historical background was printed and dropped on every doorstep in the neighborhood: “The East Village is a residential neighborhood settled by Polish immigrants, beginning in the late 1860s. 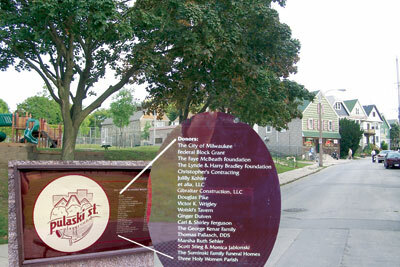 The Association’s housing styles consist predominantly of modest frame structures, including workers’ cottages, ‘Polish flats,’ single family houses and duplexes, as well as a handful of brick buildings, interspersed with a scattering of commercial structures, all densely packed into an approximately four-square block area with an irregular street pattern… By the time Milwaukee began requiring building permits in 1888, the area was already well developed. As a result, a majority of the buildings lack original building permits. Even after 1888, immigrant property owners were often less than scrupulous about obtaining permits.” Historic Ironies Within this history lie several grand ironies. First and most obvious is a tension familiar to preservationists. When trying to preserve historical structures, when does history stop? Of course it never actually stops, but at what point does it deserve to be preserved? The Polish immigrants who built the neighborhood were constantly modifying and jerry-rigging their homes. Is preserving tradition preserving the changes these now-dead homeowners made, or is it allowing current homeowners to alter their houses as they see fit? The second irony is a tension unique to the East Village. Most preservation efforts, most historic districts, focus on formerly wealthy neighborhoods. This can be explained cynically as an elitist bias on the part of preservationists, or materialistically as a tendency of more expensive buildings to be better built, and hence more likely to last. In any event, when the East Village was put on the National Register of Historic Places (a label which carries prestige and tax incentives but no zoning changes) in January of 2004, it was an unusual accomplishment for a neighborhood first built — and first owned — by the working class. The third irony is unique to the personalities involved in the current clashes. The Wolski/Bondar family has deep roots in the historical community, and yet they are prominently opposed to the current preservation efforts of the EVA. The grandmother of Bernie, Mike, Dennis, and their sister Jill was born next door to the current site of Wolski’s in 1896. The land underneath Pulaski playground, which sits on the other side of Wolski’s, was donated to the city by their great-grandfather. The Bondars, descendents of immigrants who built the neighborhood, have a very different concept of preservation from the current powers-that-be at the EVA. “Preserving the neighborhood,” explains Jill, “is preserving the people, not preserving the properties.” People vs. Property Herein lies a political clash, which should be familiar to most Americans alive today. The property rights crowd vs. the neighborhood cohesion crowd. The cowboy individual vs. the community consensus. One is tempted to also describe it, politically, as a conservative vs. liberal dispute, but local politics are seldom so tidy. It is true that Citizens for Responsible Government (CRG), a group often labeled as a bunch of suburban conservatives, has joined the battle against the Overlay District. But Kaye, for one, resolutely resists such labels. “I’m a bleeding heart liberal,” he insists. “We called in the CRG because we share a common cause. It’s not political. It’s about clean government, and that’s it. I even liked Clinton.” As soon as Kaye makes this comment about our former president, he gets a dirty look from Jill, who has just bought him a beer. When it comes to national politics, Kaye does not agree with Jill or her brothers. Locally, however, they are united. When it comes to derogatory labels, the East Village neighborhood currently has no shortage. The opponents of the Overlay District are supposedly a den of politically motivated outsiders, absentee landlords out for a quick buck, or even, if certain mumblings are to be believed, a bunch of cranky, lazy drunks. Meanwhile, the proponents of the Overlay District have been called elitist busybodies, a pretentious social club, hypocritical schemers out to steal elections from the people. The issue of neighborhood elections, and the prickly question of “What do the people really think?” are not easily settled in the East Village. Both sides have a theory, and a narrative, and part of these competing stories is the complete idiocy and maliciousness of the other side. (For the sake of the neighborhood, we must hope that they are both wrong.) The Bondars have a map of the neighborhood colored with pink and blue markers. For each property lot in the tax key, they have colored it blue if the owner is willing to sign a petition against the Overlay District. They have colored it pink if the owner refused. If they don’t know, the lot has remained white, the background color. So far the decisive score on their map is 128 against, 20 for, with about 70 lots unaccounted for. Meanwhile, the old guard at the EVA has a list. It is list of voters — a head count, not a property count — of individuals eligible to vote in last November’s election. By Ferguson’s reckoning, 33 of those EVA members, most of whom have been in the organization for years, support the Overlay District. Meanwhile, 41 members, most of whom joined in the months right before the November EVA election, were opposed to it, and wanted to vote the current board out of office. “In the history of this association,” recalled Christopherson, “we had never had such a contested election.” Although there were 74 eligible voters, the ballot box on November 17 ended up with only 64 ballots. All 10 of the voters who did not cast ballots were from the group of 41 spearheaded by the Bondars. In the election for President Elect of the EVA, Carl Ferguson (Shirley’s husband) beat Mike Bondar by a count of 33 to 31. How to Heal? The fallout from that election, however, makes Florida in 2000 look quick and amicable. Bernie won an at-large seat on the board, and he has been bringing up his long list of complaints about the election process at every board meeting since. “We still want to talk about the election,” he said at a neighborhood meeting 10 months later. “Half the neighborhood hates you. You can’t heal unless you get it off your chest.” Bernie’s first complaint is that Carl never should have been on the ballot. In section 4 under Article IV of the EVA bylaws, it reads, “Nomination… of candidacy shall be permitted in the election of officers and Board members, which will take place at the early fall General Meeting.” Carl was not nominated until after the meeting, so Bernie thinks his brother Mike should have been able to run uncontested in November. “It says ‘at’ the meeting,” emphasized Bondar several times, “not before or after. But ‘at. '” Christopherson does not dispute the timing of Carl’s nomination, but she says it was in the spirit of the association’s history, where all those who want to run are allowed to. “For years,” she explained, “this was an informal organization.” Lisa’s predecessor as EVA president, Mark Behar, agrees. “The real test of a bylaw,” he said, “is a crisis, and we didn’t have the foresight to see this coming.” In the differing accounts of this one detail lie the real roots of the disagreement. For over a decade, the EVA was like most other neighborhood associations. It had a small core of committed members who organized street clean-ups and printed a newsletter, but was ignored by many residents. Yes, it had bylaws, but nobody really paid attention to them, because bylaws are boring, and because it’s just a bunch of neighbors getting together, and hopefully getting along. Then the EVA changed, and went from talking about “parking and dog poop” as Shirley describes it, to talking about the encroaching condo developments all around them, and how to preserve the unique character of a historical neighborhood. Soon the EVA was in regular consultation with Ald. D’Amato and officials at the Department of City Development. Over the course of many years and many meetings, they came up with guidelines for the Conservation Overlay District. This was certainly no secret, as a quick look at EVA newsletters from 2003 reveals, but suddenly by the spring of 2004 some neighbors were getting angry that there might soon be restrictions on how they could replace their fences, porches, windows, or garages. And these neighbors, who previously did not attend meetings or care much about what the EVA was doing, started reading the bylaws very carefully, more carefully than the long-time members, and looking for holes. Bernie’s second complaint is that when his group showed up a half hour early for the 7 pm November election, there were already ballots in the box. According to Shirley, this was a courtesy extended to both sides, allowing members to vote in advance if they could not attend the evening meeting. Where Shirley sees a courtesy, however, Bernie smells a conspiracy. Single Transferable Voting If there were any real juice to the conspiracy theory, it could lie in Bernie’s third complaint, which is that the vote count for the five at-large seats on the board was not done by simple majority. It was done by an unusual and complicated voting method called Single Transferable Voting (STV). “It’s an obscure method,” complained Bernie, “used in Malta, Ireland, Cambridge, Berkeley, and Zambia. It’s a way for a minority to control a majority.” Bernie is right that in a worst-case scenario, an organized minority can defeat a majority if they coordinate under the STV system. The trouble with his claim in this case however, is that his side was actually in the minority. There were 33 voters trying to keep the old board in place, and only 31 trying to vote in a new one. In the end, after all the STV ballots were cast, Bernie ended up winning a seat on the at-large board, along with his ally, Brian Delfosse. The three other at-large seats went to Mark Behar, Ginger Duiven, and Norbert Young, all long-time EVA members. So 3 of the 5 at-large seats went to the majority, and 2 went to the minority. It seems like a reasonable outcome, but the question still lingers as to whether the tactics of the EVA old guard were unreasonable. The smoking gun in the conspiracy theory is an e-mail sent by Shirley Ferguson to 13 EVA members. This e-mail was anonymously turned over to the Bondars by one of the recipients. In it Shirley writes, “We need to vote in this order for At Large nominations: 1 Mark, 2 Todd, 3 Ginger, 4 Norbert — do not deviate from that order. DO NOT vote for anyone else. This is the only way we stand a chance of winning a couple of seats.” Shirley wrote that e-mail thinking the other side was going to have the majority. As a board member she had a list of eligible voters, and she knew it was 41 to 33 against her side. What she did not know was that 10 of the 41 would not end up casting ballots. Under the STV system, it’s conceivable that even if all 41 had voted, the 33 could have won more than their share of at-large seats by coordinating in the fashion described in Shirley’s e-mail. As it turns out, a fair share was won by all, but the machinations on one side left the other side very angry. For Behar, this is a very regrettable turn of events. “In retrospect,” he admitted, “the voting system was not explained to everyone’s satisfaction before the meeting.” Duiven, however, is unapologetic. “What they’re really angry about,” she said, “is that they lost. They were so sure they were going to win, because they had all these memberships of people who don’t even live in the neighborhood. Our strategizing was not a dirty trick. The dirty trick had already occurred, and that was that they had packed the room with pals and neighbors who don’t really care about the neighborhood. They brought in non-relevant people to steal the election.” “A Chilling Effect” So there you have it. Both sides are accusing the other of trying to steal last year’s election, and this year’s election is only one month away. Meanwhile the name-calling, and the ugliness, is only getting worse. Kaye’s lawsuit has seriously raised the stakes. When I showed up to get the list of voters from Shirley Ferguson, she handed it to me across a copy of the lawsuit, which had just been served to her by a court official the previous day. “This lawsuit,” laments Behar, “has really had a chilling effect. Who would possibly run for office in a neighborhood association if they know they might get sued in federal court?” Delfosse says that he plans to run for office this November anyway. “Why should I be scared?” he asked at last month’s informal meeting, which was convened by himself and Bernie. “I know that I’m not going to break any laws.” Delfosse is more concerned with the political than the legal solution, however. “All kinds of laws have been broken,” he contended, “but we can’t rely solely on the laws. A better thing to do is to take over the association and get the ear of city hall instead of this hand-picked group doing the alderman’s dirty work.” It must be noted at this point that whatever animosity exists between the overlay opponents and the EVA old guard, it is peanuts compared to the animosity that exists between those opponents and their alderman, Michael D’Amato. “These people,” said D’Amato of the Bondars, Kaye, Delfosse, and their allies, “are trying to destroy anybody or anything that gets in the way of their narrow self-interest. A group of predominantly absentee landowners has tried to destroy people’s lives and spread awful lies. They are some of the most unneighborly people I have ever met.” When I reminded D’Amato that Bernie and Jill live in the neighborhood, and that the three Bondar brothers run a nearly 100-year-old family business in the area, he replied, “Yes, a business that they profit from. There are other people that have not only been there, but have contributed to the neighborhood.” Those other people D’Amato is referring to are his allies on the EVA, those people like the Fergusons and the Christophersons who have been going to meetings for over a decade, organizing improvements to Pulaski and Caesar’s Parks, and arranging historical tours of the neighborhood. “Bernie is upset that the new guidelines might affect property values, because they might scare developers away,” argues Duvien, “but for ten years we [the EVA] were affecting his property values, and in a positive way. He was happy to sit back and laugh and drink beer while he became a millionaire, but now he’s upset?” With nine lots along Pulaski Street to his name, Bernie is the largest landowner in the East Village. The way he sees it, this should give him that much more say in the neighborhood association. “I pay nine times the taxes,” he argues, “why shouldn’t I have a say in how this neighborhood is run?” Who Speaks for the Neighborhood? Kaye could not agree more. “Who pays the taxes,” he argued, “that’s who should speak for a neighborhood.” Kaye lives in Glendale, but owns a home along Pulaski Street, right across the road from Wolski’s. “That was the most blighted house on the block,” he recalled, “I spent months rehabbing it, and now look at it. It’s one of the prettiest. There is a legitimate purpose for absentee landlords, so that people who can’t afford to own a home can have somewhere to live. While they [the EVA] were organizing block watches or whatever they were doing, I was improving the neighborhood and its property values directly. They should not claim exclusive credit for that.” Even if one believes that absentee landlords are generally a bad influence, Shirley Ferguson’s own numbers do not support the claim that all of the overlay opponents can be labeled as such. Of the 41 opponents, only 11 are absentee landlords, while 19 are owner occupants and the rest are renters or affiliate members. Twenty-four of the 33 overlay supporters are owner occupants, but Bernie disputes those numbers, because 12 of those 24 are composed of six cohabitating couples. “If they only own one house,” he asked, “how can they get credit for being two homeowners?” That comment illustrates a fundamental division of political philosophy between the two sides. The Bondars look at their almost entirely blue map of the neighborhood’s tax lots, and think that should be an open and shut case against the Overlay District. Meanwhile, the EVA old guard looks to last year’s election, and concludes that the majority of those committed enough to attend meetings are in favor of the overlay guidelines. At the core of this nasty disagreement, then, is a legitimate and fundamental debate about the civic future of a neighborhood, and who should get to decide that future. Unfortunately, that important debate has been lost amidst name-calling on both sides. At this point, the future of neighborhood relations looks bleak, especially considering one of the new overlay guidelines. It specifies that front and side street fences “must not exceed 4 feet in height and must be 50 percent transparent.” They say good fences make good neighbors, but 4 feet high and see-through might not be good enough for Milwaukee’s East Village.